What’s the Difference Between a Smart and Wireless Thermostat? A smart thermostat is a thermostat that practically runs itself, equipped with the same technology used in smartphones and tablets. They’re typically touted for their ability to observe a homeowner’s heating and cooling habits and make adjustments accordingly. A wireless thermostat’s main feature is that it can be controlled via a computer or other internet-connected device, such as a smartphone or tablet. This allows a homeowner to adjust the temperature from anywhere with an internet connection. Often, the features of these thermostats overlap with each other. We recommend closely working with a professional in HVAC services in Westchester, NY to find a thermostat that fulfills any desired features. We do not recommend that homeowners attempt to install thermostats on their own. A capable or handy homeowner could very well complete the installation on their own, but they would need to ensure that they are installing a thermostat compatible with their current system. A professional is needed to inspect the system, assess the homeowner’s goals and desires, and then find a product that is compatible. Installing an incompatible thermostat brings risk of damage to the HVAC system and the thermostat itself, and it can also void warranties for both products. How Will It Increase My Efficiency? Just having a smart or wireless thermostat installed doesn’t necessarily mean it will automatically start lowering energy bills. The homeowner will have to take care to program it according to their goals. Smart thermostats do operate near automatically, but only according to the direction they’re given. If the goal is to reduce energy consumption, the thermostat can be programmed to make adjustments automatically. However, if it’s configured mainly for comfort, it will act with less consideration to energy consumption. They can also be integrated with home automation systems to increase efficiency. For example, if the thermostat is integrated with door and window sensors, it can turn off the HVAC system when it detects a window or door has been opened. Other efficiency benefits come from new functionality that wasn’t previously possible with older thermostats. For example, daily energy reports can give homeowners a wealth of information on how they’re using their energy. The wireless capabilities also allow for adjustments away from the home. 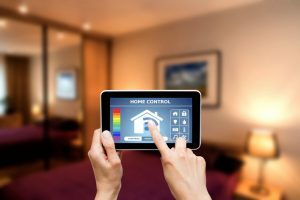 If the thermostat is set to run on a fixed schedule and the homeowner needs to make an adjustment, wireless controls can change it from anywhere with an internet connection. We can answer any questions about thermostats. Contact Yost & Campbell Heating, Cooling & Generators.